He won his first Emmy on Monday. And Darren Criss looked like he was relishing in his success while out in the Los Feliz area of LA with his fiance Mia Swier and his parents on Tuesday. The Assassination Of Gianni Versace star, 31, dressed in a Disneyland themed tee-shirt and shorts for his casual outing with the family. Darren remained relaxed in slide sneakers. While a dark beard covered his face, it was groomed neatly. Walking a few steps ahead was fiance Mia, who the Glee star became engaged to in January. The writer/producer looked radiant in a casual white outfit. Keeping practical, she wore a backpack instead of carrying a purse. His parents Charles William Criss and Cerina Bru joined the fun. 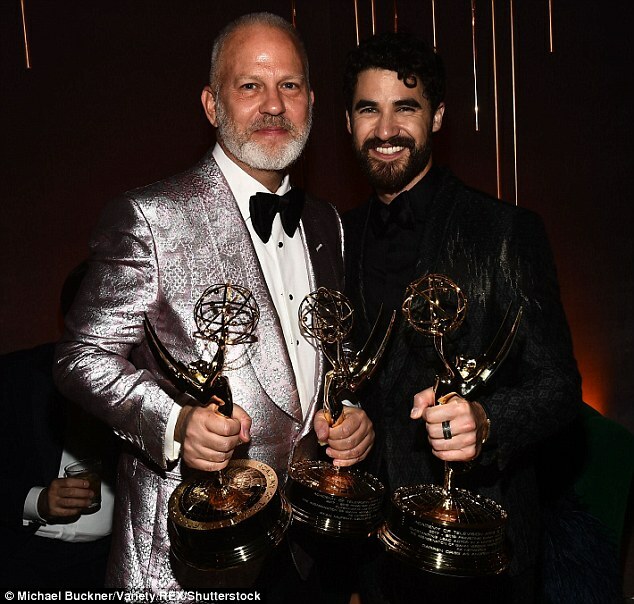 At last night’s Emmy’s Darren took home the award for Outstanding Actor in A Limited Series or Movie for his role as serial killer Andrew Cunanan in The Assassination of Gianni Versace: American Crime Story. During his acceptance speech he made sure to share thanks with the creative team, saying: ‘Actors are only as good as the moments they’re given and granted. The award marks Darren’s first Emmy. The Assassination of Gianni Versace: American Crime Story went on to win Outstanding Limited Series and creator Ryan Murphy won the category’s directing accolade.